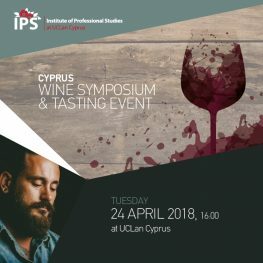 The Agriculture School of the Institute of Professional Studies at UCLan Cyprus is inviting you to a special Cyprus Wine Tasting Event. The Symposium will include a short presentation on the Cyprus Vines & Wine production, Wine Marketing and export. The awarded as best Sommelier of Cyprus for 2015, Mr George Loukakis, will demonstrate the art of Wine Tasting and food matching. A reception will follow at the lobby with Wine & Cheese stations of Cypriot wineries including Constantinou Winery, Vasiliko Winery, Kamanderena (SODAP) Winery, and the special wines of the Anama Concept.